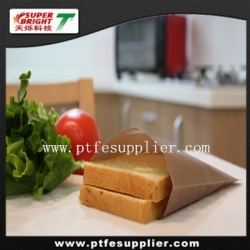 Turn your toaster into a grill with PTFE Toaster Bags . Slide a sandwich into the non-toxic, non-stick bag and toss it in your toaster. Within minutes, you'll have a perfectly toasted and delicious sandwich. Ham sammies, grilled cheese, paninis, pitas, garlic bread, pizza slices, and even bacon can be cooked in your toaster.